I just returned from a weekend in New York where I helped run an event called SecretCon (by the way, I’m really good at running technology conferences–feel free to reach out if I can help you). My flight to New York on Delta was more or less uneventful. I was informed at check-in that the flight was oversold and offered the opportunity to volunteer my seat. However, my seat wasn’t needed and I arrived at JFK on time. For the return flight, on Sunday evening, I arrived at Delta’s JFK international terminal (flights to LAX depart from the international rather than the domestic terminal) and found the gate was a total madhouse. On a hunch, I asked whether the flight was oversold. Wow, was it ever. The gate agent was happy to let me volunteer my seat. “I already asked for volunteers and didn’t get any, so I’ll put you in for the maximum bid.” Like many airlines, Delta operates on a bidding system–they start at $200 and go all the way up to $800 if you volunteer your seat. Delta ended up bumping me, but they also bumped 4 other people off the flight. These were people who were connecting from an international flight and had technically not arrived in time to make the connection, so they weren’t entitled to any more compensation than a hotel overnight (since the late arrival was Delta’s fault). As the only volunteer, I was entitled to the maximum compensation offered in these situations, which was $800 plus an overnight hotel and a meal voucher. “So what,” you may be saying, “a restricted and practically worthless airline voucher that expires before you can use it.” Well, that used to be true, but Delta has apparently changed denied boarding compensation in some situations. At least if you volunteer your seat at the gate instead of online, you can receive a gift voucher which is more valuable. I was asked for my email and received a message inviting me to a gift card reward portal operated by Connexions Loyalty, Inc. A Delta gift card was an option, along with gift cards from various department stores, but an American Express gift card was also an available option. Obviously, I chose this option. Why would Delta do this rather than sending you a check or giving you cash? Well, there’s a chance that you won’t spend all the money on the gift card before it expires, and gift cards can probably be purchased for less than face value (because American Express receives swipe fees from every purchase you make). That’s not the most interesting part of the story, though. The most interesting part is that Delta apparently now internally values transportation on Delta at near cash par value. However, consumers don’t assign the same value to airline vouchers. They do value gift cards at near cash par value, though, so Delta has likely added these options in order to increase the number of bidders in oversell situations, hence lowering the amount they’ll have to pay.What does this mean to you? 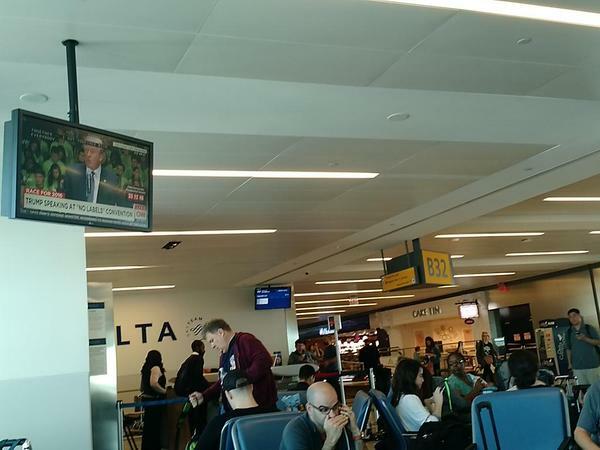 Volunteer to be bumped on Delta as many times as you can before the news gets out! You might be pleasantly surprised at being given the option of receiving an American Express gift card instead of a semi-worthless voucher. Another good offer from Hainan Airlines, one of the newest Alaska Airlines partners, on flights to China. Complete a survey (link here) and receive $80 off! Hainan often has the lowest prices to the cities they serve in China anyway, so this is icing on the cake–and you can also receive Mileage Plan miles.